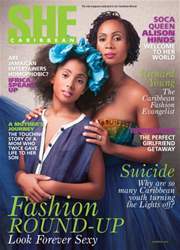 Soca Queen Alison Hinds graces the cover of this exciting issue! Welcome to her world! Read her story on how she balances her entertainment life with that of being a mother. A theme which resonates with the professional Caribbean women everywhere! Caribbean Fashion Evangelist, Richard Young features inside. Learn more about the fashion Icon! Fashions from the Caribbean Runways of the Bahamas, St. Kitts . Stories, Features and more jam packed inside this issue.